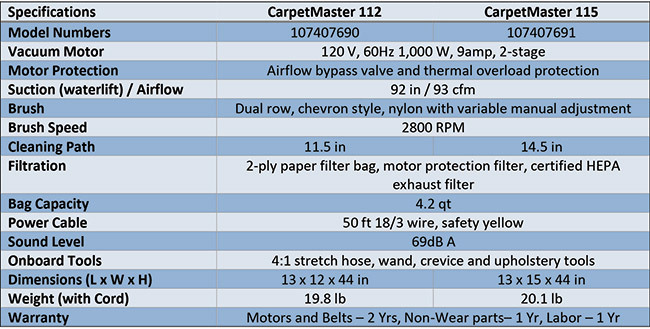 Introducing the Carpetmaster112 and 115 series. Manufactured by Nilfisk under the Clarke name this commercial grade bagged vacuum is ergonomically designed and CRI certified. 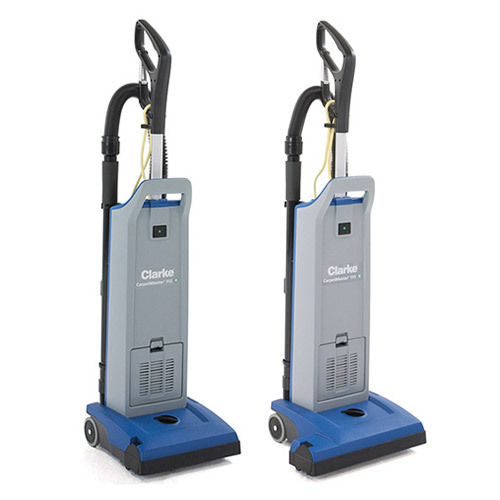 Designed for the professional cleaner, the 112 series has a 11.5" powerhead and the 115 series has a 14.5" powerhead. Exceptional dirt pick up and a high efficiency 3 stage HEPA filtration system makes this a great vacuum for schools, hotels, and office buildings. Each vacuum has tremendous edge cleaning performance and a low decibel rate for daytime use. If onboard tools are a priority both series includes a quick draw wand, stretch hose, crevice tool, upholstery tool and a 50 ft cord. Comes with a 2 year warranty on the motor and belts, 1 year on non-wear parts and 1 year on labor. Check out the Clarke CarpetMaster 112 and 155 on our website and if you have any questions please feel free to give us a call at 1-800-533-3249.